In the last year, I have read quite of few online editorial articles about the benefits of decluttering your home, mind and life. Our home is a very typical home that is filled with too many toys, clothes and general stuff. I do believe that one of the best ways of creating positive changes in my family and my life is to look at ways to improve our home environment. A more organised home have many benefits including less time searching for items and less clutter to sort constantly. 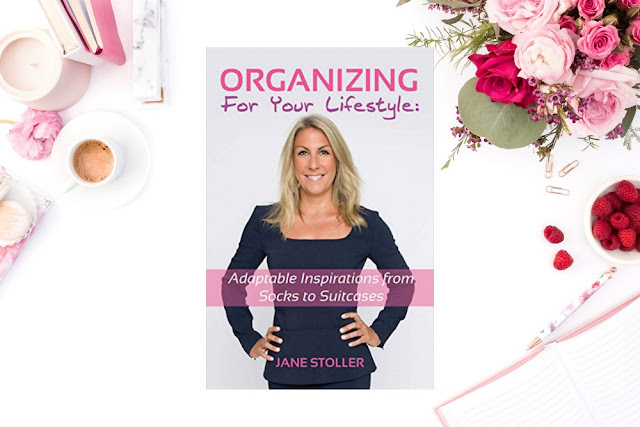 When I received an email offering to receive a copy of Jane Stoller's book titled "Organizing For Your Lifestyle: Adaptable Inspirations from Socks to Suitcases", I was very interested to reading. From a very young age, Jane had a passion from organising her possessions and storage options as an adult. This books if filled with interesting information about the science behind the stress behind disorganisation and how changing your lifestyle to be more organised can benefit your life. Some of the benefits expressed by Jane include: healthy eating; more likely to exercise; sleep better in clean sheets; improved finances and improve relationships with partner. Jane has travelled and lived around the world and often with limited closest space. Jane shares some very practical ways to organise your closet including examples of storage options that can be purchased from several major retailers. She provides some helpful advice when it comes to hangers and how important invest in the appropriate hangers for your garments. She suggested black velvet wire hangers because they don't require lots of space and your clothes will not slip off. Another very interesting statistic that Jane mentions that 40% of people who de-clutter never manage to get stuff out of the house. She recommends that you donate clothes immediately after sorting and before you sneak them back in your closet. I am very guilty of boxing or filling bags of clothes to donate and then sitting in my home for months. The book is arranged into common themes to help you organise your home. From the kitchen to the bathroom, Jane shares ideas, advice and inspiration to help you lead a happier and healthier life. There’s also an interesting chapter about travelling preparations. I think we all can admit that we have over packed for previous travel adventures. I have regretted hauling around heavy suitcases with no space for souvenirs and fearing about the overweight charges at the airport. Jane has lots of valuable advice to prepare for travelling and suggestions of essential clothes. These days, I only travel domestically or internationally a couple times a year but Jane would suggest have a pre-packed toiletry case that is filled with bottles of items under 100ml size. A clear toiletry bag will get you through security quickly and easily. She suggests asking for samples at your favourite cosmetic counters and purchasing travel sizes in toothpaste and shampoo/conditioners. Just re-fill sample or travel sized bottles when you get home. Jane shares her favourite carry-on essentials. She recommends buying an extra cell phone charger and leave it in your suitcase at all times. She shares the best travel adaptor that she has found and reminds you not to forget your portable luggage scale. I definitely will be investing in a pair of Havaianas flip flops on Jane's recommendation of how versatile they are while travelling. She recommends packing a portable negative ion generator and I must research more about this product that helps reduce jet leg as well as breathing difficulties in flight. This book is filled for practical and useful advice that you can instantly implement in your life. It is extremely easy and quick book to read with photos that illustrate Jane's advice. This book provides guidance that can be adapted to your lifestyle as a parent or as single lady travelling the world. I would highly recommend buying this book in the future. I was sent a complementary book to read and this review is honest in my own words. Thank you!